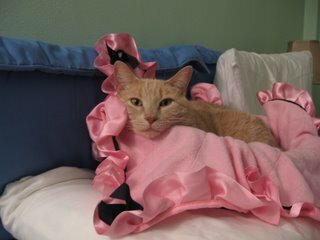 Mommy could not resist buying this pink princess blanket for me to snuggle on. It is cuddly and pretty, like me. And I like my cat bed so much more with the blanket on top of it. You have never looked more glamorous and beautiful than you do on your princess blanket. It is quite clear in the picture how much you love it! The ruffle and black trim are priceless additions! You look like you really love your princess blanket. It sure is fancy! Did I hear your Mom got it at Pet Smart? I am going to ask my Mom to look for a "Prince" blanket there for me. Hi Audrey. I love your blanket. It looks very purty on you. I saw you over at Brandi's and thought I'd say hi. I hope your cousin Flossie is doing better! Stop and visit me some time. I'm going to introduce you on the cat blogosphere news page sos everyone can see your purty blankie. Hi Audrey! Nice to meet you and I too love your pink blanket! My Emma loves pink too and she just got a new pink bed w/hearts on it! Yu do look furry purrty on yur pink blankie. It wuz nice to meet you. I am Abby, drop by our bloggie sometime when you can fur a bisit. Hi Audrey! I'm Pablo from Australia. Just wanted to say hi (found out about you on the Cat Blogosphere) and to let you know that Audrey is an AWESOME name for a cat. Because which human starred in the Best Movie Co-starring a Cat Ever? Audrey Hepburn. Audrey, your new blanket is divine! I hope you are doing well on your blanket in this ultra-cold weather. I have a "nest" of assorted blankies bunched together on the couch that I am spending a lot of time in/on. Brrrrrrr. I will try to send you a picture. My Mom still did not go to Pet Smart to look for a "Prince" blanket for me so I am making do with what is here already. Hi all you other blogging kitties! Nice to meet you.